RICE vs MEAT? We may have to call the POLICE. I’m sure every athlete, trainer, or participant on a first aid course is familiar with the acronym RICE… RICE is a mnemonic for four elements of treatment for soft tissue injuries; Rest, Ice, Compression and Elevation. The mnemonic was introduced by Gabe Mirkin in the Sportsmedicine Book (ISBN 978-0316574365) during 1978. Rest - The intention of introducing a rest period after injury was to stop the individual from causing further damage, causing more pain and increasing the inflammatory exudate in the injured area. The question is for how long? Rest is only indicated for 24 - 48 hours and then we know modified activities can be started, but how often do you find Uncle Harry at home on the couch resting his back that has been injured for the last 40 years… does this really help? Well Uncle Harry does not seem to be getting better is he? ICE - Ice reduces the bloodflow to affected areas by decreasing the diameter of blood vessels that supply the area with blood. This could potentially help stop bleeding and reduce the inflammatory response decreasing swelling and pain. There is good reason to do this within the first 24 - 48 hours, but applying ice directly to your skin could cause frostbite and by applying it for too long could also cause thermal injuries. Ice should always be applied through a towel to cool the area slowly and no more than 20 minutes without a break in between. COMPRESSION - By applying gentle pressure, not so much that you restrict the blood flow will help keep fluid from pooling in the area and also help decrease the swelling. 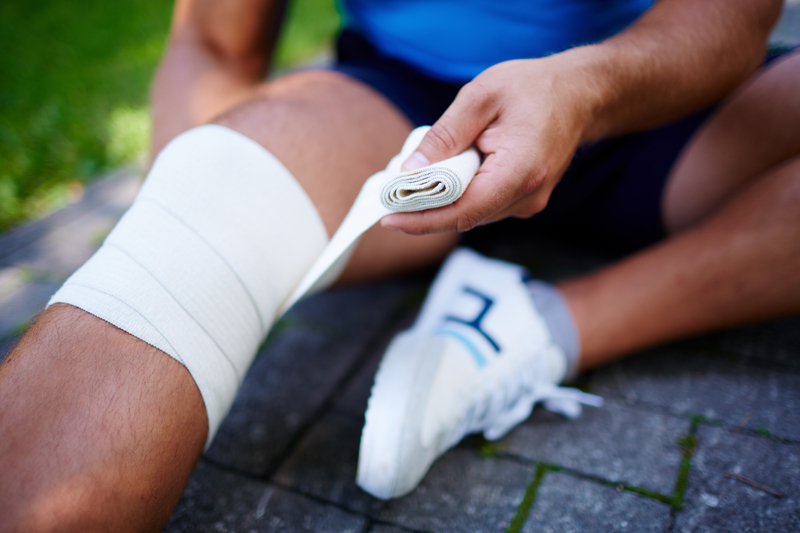 The compression should always be applied with an elastic garment or bandage that will allow movement… this is not a tourniquet and the injured limb should be regularly inspected for good blood flow. ELEVATION - By lifting the affected limb above the level of the heart blood flow from the area is promoted and again the pooling of fluid in the area is reduced. PROTECT - Instead of using a word such a rest the word intends to encompass more options such as using crutches, braces and other methods that could be used to restrict or unload the structure. OPTIMAL LOADING - This might be the word I term I prefer best, as some loading will be helpful to the healing of soft tissue injuries… but finding the balance without some education might be very difficult for patients. My general advise would be that the activity my cause some discomfort but no lasting increase in pain intensity should be experienced. MOVEMENT - Movement is beneficial as this help improve circulation, mechanically loads tissue to stimulate healing! This movement also need to be sufficient to bring about the benefits without being detrimental this could just be gentle natural movements as you test out the injured structures. EXERCISE - Beyond just getting the affected limb moving it is important to start the journey back to regular exercise. You might not be able to continue on past intensity levels , but you will have to start somewhere. Hopefully you have already experiences that with regular movement your functional ability has slowly improved. Here you would expect the same response a slow and gradual improvement in your tolerance level. ANALGESIA - If your pain level is so high that you are unable to get moving and exercising this might be of benefit! Certainly we would recommend that you seek professional help if this is the case. TREATMENT - This might not always imply what you think, and certainly in tendon injuries there is enough evidence to recommend avoiding passive treatments. By seeking help from a Physiotherapist who will do a proper assessment, treatment could be directed to getting you back and active as soon as possible. At GRB Physiotherapy we strive to getting patients functional as soon as possible and the most important component to such a strategy would be a thorough assessment. Call us now to book your appointment.